Shaving of blocks, also known as trimming of blocks. In the histopathology department, most blocks are trimmed before they are sectioned. 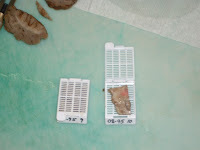 The purpose is to allow the tissue to be fully exposed before sectioning. It is required that as much area is exposed, to allow the pathologist to read a greater area of tissue. The greater the area, the higher chances that the pathologist will read it correctly. ie lesser false negatives. Occassionally, there will be staple bullets and sutures in the blocks. (Sutures are sugical threads) Where do they come from? When the surgeons operated on the patients, they staple the organs/tissues or tie sutures around them to allow orientation. Thus, when pathologist cut these tissues, they may also put these sutures and staple bullets into the cassettes and sent for processing. Sutures and staple bullets do not interfere in tissue processing but they will damage the microtome blade. It MAY damage the tissue processor IF the tissue processor uses microwave technology. If a metallic object is placed in a microwave, a "mini-thunderstrom" will occur in the microwave. Microwaves electrically charge the air between a metallic object and the metal contained in the oven walls. This ionized air produces an electric current like a small lightning bolt. Shaving is done using a blunt reused blade (to save money) and is cut at 20um at each swipe of the blade. However, there is a speed up button. When you hold down the button, it is cut at 50um or double the cutting distance. This would help the user speed up shaving. However, we must be cautious when holding this button because when we encounter small tissue, we may over-cut it and the whole tissue gets cut-away. After the blocks are trimmed, they are softened using a strong detergent. Why? Because some tissues are hard like fibroids. It would be difficult to section. What about bones? They are the hardest thing in the human body. A strong detergent would not be able to soften them. In this case, we use a decalcifying agent to remove calcium from bones. Calcium crystals is what makes the bones hard. A mild acid is enough to decalcify bones. Softening is done in 5minutes and decalcification is done for a few hours. In embedding, the basket of tissues are removed from the tissue processor and placed on the heated surface of the embedding machine. Next, we would account for all the cassettes, we must ensure that all the cassettes are present. This is done by checking with the checklist, which is written before the cassettes are placed in the processor. Once the number of cassettes are checked, we would next need to count the number of tissues in the cassette, which corresponds to the number written on the cassettes. For example, if the cassette is written x3 or x6, there must be 3 and 6 tissues present respectively. If there are not, we must report it immediately as the tissues may have dropped out during processing. If this is left unreported, we would be held responsible for any missing tissues. Then, we select the most appropriate size mould. If we select a mould that is too big, we would be wasting wax. If the mould is too small, there wouldn't be enough "grip" onto the slides. Wax is needed to grip onto the slides during sectioning. First, pour alittle moulten wax into the mould, then place the tissue onto the mould. Gently press the tissue down so that it is flat. (Shaving would be easier if we press down the tissue. Remember what I said? 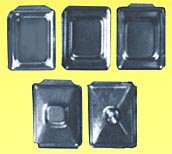 We must expose as much area as possible) Then, we place the empty cassette over the mould, without the cassette cover. Pour alittle more wax and voila! Let the block cool down on the cold plate. After 5 mins or so, we can pluck out the block from the mould. I will touch alittle on special stains. Namely, the difference between PAS and PASD. This is the only manual stain I have done so far. PAS stands for Periodic acid-Schiff. It stains glycogen in tissues. How? The periodic acid reacts by oxidizing the glucose residues and creates aldehydes that reacts with the schiff reagent. This creates a magenta colour (purple). A counter stain will then be used, usually a basic dye. In my lab, we use haematoxylin, to stain the nucleus. The D in PASD stands for diastase. It is an enzyme which breaks down glycogen. In the past, lab technicians can use their sailva because saliva contains amylase. However, our saliva contains many impurities, thus it is not ideal. The commercial diastase is recommended. Since PAS stains glycogen and diastase breaks down glycogen, PASD is the negative control. A light pink colour would be present instead of the magenta. Often, PAS and PASD are performed together on the same slide but different tissues. Differences in the intensities of the 2 stains can roughly quantify the glycogen concentration. Ulitmately, PASD is to ellucidate gastic duodenal metaplasia, commonly found in dudenal adenomas. What do the pathologist look out for when they read the tissue? Like for example, in mirobioloy, they look out for bacteria. Then what about histopathology? what are some precautions you have to take when cutting small specimens? and you mentioned that the blocks are softened using a strong detergent, may i know what exactly is the strong detergent? is there any specific type of tissues that has to go through the PAS stain? oops that was me by the way. Is the special stains only for diagnosis of gastic duodenal metaplasia? what was the strong detergent you mentioned that softens the tissues? wads an example for a mild acid for decalcifying? you mentioned that the greater the area, the higher chances that the pathologist will read it wrongly. so why still allow the pathologist is read a greater area of tissue? since staple bullets and sutures will damage the microtome blade, how do u go about removing them? and what is the strong detergent u mentioned to soften the tissue? lastly, from what i learnt, after staining with Schiff's reagent, one must ensure that it is completely dried b4 counter-staining with haematoxylin, does your lab do it in the same way too? thanks! They look for any abnormalities in the cell. For example certain inflammations or intestinal carcinomas, excess mucin is present. Thus by performing mucicarmine stain, the pathologist can look out for excess of mucin in epithelial or connective tissue. In general, the pathologists search for tumours and micoorganisms. When cutting blocks with small tissue, we must ensure we do not waste them. Some are cut at 2 um instead of 4. Also, other precautions include not shaving the blocks. The detergent is Softlan (brand name) which can be found at supermarkets. PAS stains for glycogen and carbo. Examples are connective tissues, mucus, and basal laminae. It is not compulsory to stain PAS, only when the pathologist suspects something amiss, then he can request for PAS staining. Usually if adenomas occur in the small intestines, PAS can be performed to observe if there are too many or too little glycogen. Some examples of decalcifying agents are EDTA and formic acid. Sorry, I made a typo error. The greater the area, the higher the chance that the pathologist will read it CORRECTLY. Thanks for correcting me. We use tweezers, pliers needles to dig them out of the block. If it is unable to be remove, we can re-embed them. Nope, we do not ensure that it is fully dried. Just flick it. Why? because we will flood the whole side with haematoxylin. So it will still be concentrated. The electrical dischage has not occured in our machine. Our lab does not own it, it is just leased to us temporarily. However, I have tried putting a spoon in my microwave before. It is awsome. You should try it too. Yes we do need to remove the staples before we put them in the machine. However, if we miss one or two, it will be fine. Detergent: Softlan (brand name) can be found at supermarkets to wash your clothes. what is gastic duodenal metaplasia. is that a disease condition? or u can decribe what is the characteristics of the disease. Very good. Someone actually pointed out Ernest's mistake. I am quite surprised by Li Ping question. Shouldn't you have been taught in HISTECH subject? Please do not ask question for the sake of asking. Li Ping's question is really not acceptable. I hope not to see this type of question anymore.